And here I am once again to make up for my friends’ absence (not sure whether they’re even alive!). Today I’m going to continue the “around the world” journey Lourenço started (and which I later helped, even more than once) a couple of months ago . My destination will be Spain – more precisely, Andalusia, a Spanish region. Andalusia is one of the most visited regions in the world, mainly for its water-warm beaches (Marbella, Torremolinos, Cádiz, Tarifa and many other), and to some extent for its ski resort Sierra Nevada. But Andalusia is more than that! It’s a region of culture mixes – they were Iberian region with more Moorish influence (it was where they settled the longest) and most probably with the highest percentage of Romani people one – but at the same time a mirror of traditional Spanish culture (for example, with the bullfighting. Here you have the studio version. And to finalize things in a softer way, here you have the beautiful Adagio part of Paco de Lucía Concierto de Aranjuez. As some of you know, the writers of this blog (myself included) live in Portugal, a country in which the summer has arrived several weeks ago – and hopefully will remain for a few more! As so, we (I am assuming it is not just me) feel like listening to summer songs, whatever that is 😛 And although I am not sure what that is, there are some that we can label as “summer songs” quite easily. 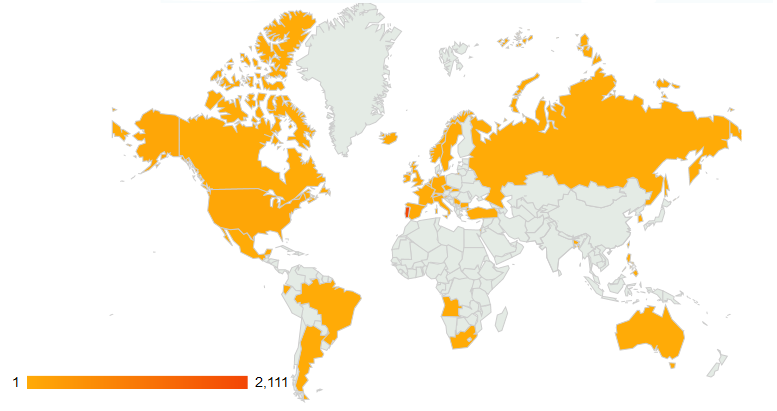 From the above map, you can see that we’ve had visualizations in every continent now! From Honk Kong to Ecuador, from Canada to Australia, we’ve shared “our” music throughout the world, and we’re very glad to be able to reach all those different cultures. How awesome is that? So, today, I’m going to take you on a journey away from the usual pop-rock-metal British/American stuff. We’re going to visit a Tunisian jazz-like composer, singer and oud player. What’s an oud, you may ask. I’ll show you one, it’s right here on the left. But back to Tunisia. Mr. Dhafer Youssef, the oud player we’re visiting, teamed up with the armenian-born pianist Tigran Hamasyan and delivered the very good album Abu Nawas Rhapsody. But enough talk, the music is what’s important. Enjoy.